Ezt a terméket eddig 2253 alkalommal vásárolták meg! Grodan Delta constitutes the basis for the uniform and perfectly controllable propagation of plants, the condition to be met for powerful and healthy plant growth. Each block has a virtually identical density, flexibility and sturdiness, guaranteeing a uniform distribution of the WC, EC and pH which in turn results in a uniform and high-quality plant. Guarantees plant propagators an optimum air/water balance. 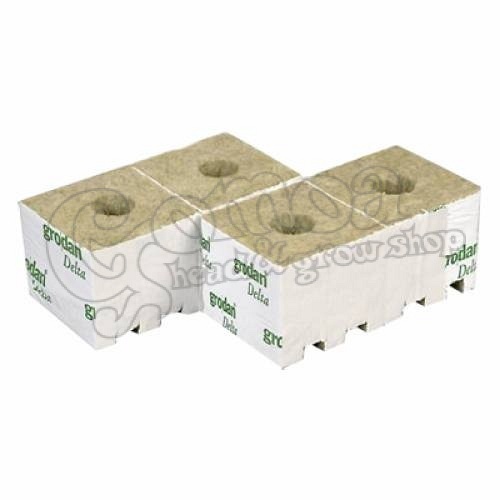 The variation in small and large pores throughout the block ensures that the roots are always supplied with sufficient air and water. In addition, the water content of the block can be controlled with great precision. The efficient pattern of the pores ensures that water and nutrients are distributed uniformly throughout the block, thereby offering excellent control over both the nutrient solution and the pH. This promotes the development of a strong root system during propagation. The uniform distribution and vertical structure of the fibres results in the same resistance for each root, thereby ensuring that the roots distribute themselves uniformly throughout the block.